For the crust: Add salt and sugar to sifted flour in a mixing bowl. Rub in butter with a pastry cutter until mixture resembles fine breadcrumbs. Add lime juice and water. Mix into a dough. Refrigerate for 20-25 minutes. Roll out the dough to fit a fluted flan tin. Trim off excess pastry and prick the base with a fork. Place crumbled baking paper on the base and spread dried beans over it. Bake in a preheated oven at 220°C for 10 minutes. Remove paper and beans. Reduce the temperature to 180°C and bake for five minutes. Heat olive oil and sauté button mushrooms. Dish out and mix with tuna. Sauté onions in the same saucepan. Lightly beat whipping cream and eggs in a jug. Add salt, pepper and chicken stock granules to taste. Pour over tuna and mushroom mixture. Add onion and zucchini. Cream butter and sugar for 4 to 5 minutes. Add ground almonds. Mix the creamed almond mixture and flour with the tuna mushroom mixture. Pour the filling into the pastry case. Spread with Cheddar cheese and add ground black pepper. 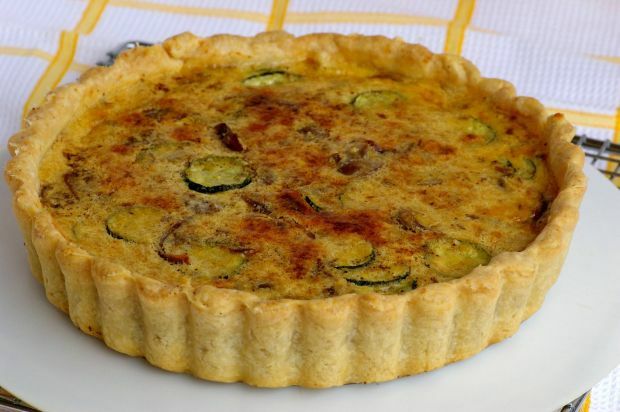 Bake for 40 minutes in a preheated oven at 180°C until quiche is set. Serve while still warm.